See the best of Auckland on a morning or afternoon half-day sightseeing coach tour that showcases the city’s highlights, from heritage -listed buildings to the stunning Viaduct Harbour to great views if you are short on time. Your coach tour with a short trip over the Harbour Bridge to the North Shore, where you will have great panoramic views of Auckland’s city skyline. Then, return to the city center to the picturesque Viaduct Harbour. Travel through Auckland Domain, the city’s oldest park, which sits upon an ancient volcano. Stop in the quaint village of Parnell to take a stroll around the historic buildings, many of which have been transformed into fashionable boutiques, antique stores and specialty shops. Your tour concludes with a drive along the scenic waterfront route of Tamaki Drive to the Michael Joseph Savage Memorial Park, in Mission Bay. The park offers panoramic views over Whenua Rangatira, Auckland and Waitemata Harbour – it’s a fabulous stop to take photos. A unique opportunity to experience sailing an America's Cup grand prix racer. Become part of the crew and be encouraged to take the helm, exert energy on the grinders or simply sit back and enjoy the action as you sail down the Auckland Harbour. Even if you have never sailed before by the time you hop off NZL 40 or NZL 41 you will be an expert guaranteed! See two magical places come to life on this day tour from Auckland. 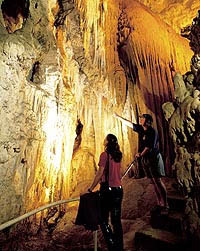 First explore the Waitomo Glowworm Caves and be entranced by the thousands of twinkling lights in the glowworm grotto. Then visit the Hobbiton Movie Set, the filming location of the village of Bilbo Bagins and his fellow hobbits in ‘The Lord of the Rings’ movie trilogy. As you explore Hobbiton, you can pose for pictures in front of the hobbit holes, the pond and the Green Dragon Inn. See the party tree, Green Dragon Inn and Bilbo Baggins’ house and learn from your guide about the making of the films. If you are looking for somewhere unique to explore, have you considered Great Barrier Island? Book this full day eco-tour and fly from Auckland Airport to a remote and untamed island. Seek out an endangered species, the Brown Teal. Take a magnificent climb to the top of Windy Canyon and admire the surrounding native flora and fauna. Breakfast and lunch included. 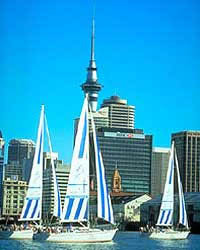 A great way to discover the vibrant city of Auckland. With this explorer bus you're on the way to discovering Auckland's top visitor attractions with ease. There is no better way to see the city other than on a hop-on hop-off double decker bus. A day of stalactites and stalagmites, glowworms and grottos! Head south from Auckland and pass through the rich farming region of the Waikato, before arriving at the famous Waitomo Caves. Enjoy lunch before heading underground to marvel at these amazing caves. Take an underground boat trip and wonder at the thousands of tiny glow worms. See all the highlights of Waitomo Caves and Rotorua in just one day! Travel through the Waikato Valley to see the intriguing spectacle of the Waitomo Glowworm Caves. Traveling by boat through the Glowworm Grotto, you'll be entranced by the luminous glow of these tiny creatures. Then it's on to Rotorua to visit spectacular thermal geysers, a nature sanctuary and a Maori cultural center. Head north from Auckland and spend a day exploring the beginnings of European settlement in New Zealand in the picturesque Bay of Islands. Visit the historic Waitangi Treaty House, then catch the ferry from Paihia to explore what was New Zealand's first capital city, Russell. Enjoy free time in both Russell and Paihia during the afternoon, before returning to Auckland late that evening. Sandy beaches and secluded bays - that is what this day tour is all about! Travel north to the scenic Bay of Islands for a cruise amongst the 144 islands that dot this Maritime Park. 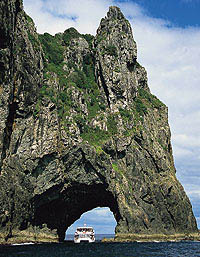 Jump aboard a catamaran to Cape Brett Lighthouse and the Hole in the Rock on Motukokako Island. 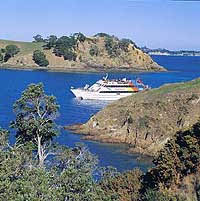 It's the Bay of Islands' most popular cruise! Spot marine wildlife as your luxury catamaran meanders past islands and bays. The ultimate Auckland cruise where you can experience scenic highlights of Auckland and it's surrounding islands plus it's marine mammals including dolphins and whales in the beautiful Hauraki Gulf. Considered one of the most biologically and geographically diverse marine parks in the world, 22 species of marine mammal have been identified in the Hauraki Gulf, almost 1/3 of the entire world's population of species. 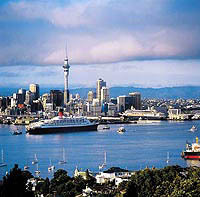 New Zealand's dramatic scenery has starred in many famous movies and television shows and this trip will show you why. You'll see the remote coastal beach that featured in the movie 'The Piano' and the otherworldly New Zealand forests and Kauri trees from the 'Hercules' and 'Xena' television series. You'll also visit a Maori cultural centre. A great day out exploring Auckland's west coast!